A budget month would not be complete without a look at some of the best budget tools available in the business. The Real Techniques brushes really were revolutionary when they came out; no longer was it necessary to have to go to premiere counters and hand over £20 for eye brushes and upwards of £25 for any kind of face brush. Now, we can buy good quality brushes in a set for the price of one MAC brush. 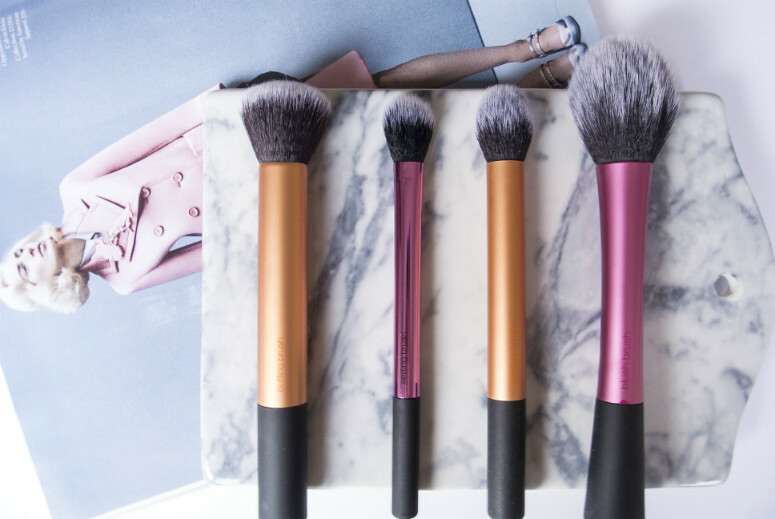 Since then, the different budge brush options have upped their game all round, and I don't think there's a beauty lover out there who doesn't have at least one Real Techniques tool in their arsenal. That being said, not all of the Real Techniques tools float my boat, some miss the mark completely. I had a look through my collection and decided on 4 that I use so often and don't think I could do without. Buffing Brush: The brush that first introduced me to the motion on buffing and changed how I apply my foundation. This comes in the core collection set, but frankly, this brush alone is worth the price of the core collection. Dense and fluffy, this will really improve your foundation game. I've since added other brushes of the similar vein to my collection, but this is one I will always still pick up and use. Setting Brush: I got this in a set, but you can get this on its own. I think it is a mini version of their Blush Brush; fluffy but at a small size so that you can gently apply setting power to exactly where you need it. I also find it helpful if I'm using a powder highlight, because I can pinpoint above my eyebrows rather than whacking it all over my forehead with a big brush and getting that lightbulb look (yay! Shiny!). Contour Brush: Another brush that came in the Core Collection, which I rely on for applying any kind of contour. I have a small face, so using a large brush doesn't work for applying bronzers when I'm using them to contour. The Contour brush fits perfectly into the nooks of my face to give it some shape and leave it less pancake like. Blush Brush: Last but not least, the Blush Brush. I've heard some people call it the perfect blush brush. To me, it's the perfect powder brush. It's a bit on the large size for me to apply blush without it covering my whole cheek (and look like I did when I was five and got at my sister's makeup collection), but it works perfectly as a powder brush. I tend to prefer natural bristles for powder products, but this picks up just the right amount on its very fluffy bristles, and I can be very controlled with my application. If you haven't used it this way, give it a try and let me know what you think. So that's a roundup of the Real Techniques brushes I use on a daily basis. I do flit about at times, but I know I can pull these out when I need something to rely on. Do you have any Real Techniques tools you can't do without?